about 0.01 mm to 1 mm at most. To study them you need a microscope. 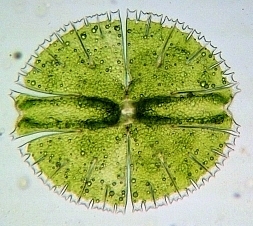 Most desmids are unicellular, but some form long strains of cells. Desmids are divided into two parts separated by a narrow bridge or isthmus. Sometimes however this isthmus is very hard to see (for instance in Closterium species). The shape of Desmids is highly symmetrical and generally very attractive, which provide the basis for their classification. Each part of the cell has one chloroplast. Sexual reproduction occurs through a process of conjugation, but more often they reproduce by simple cell division. To encourage the study of Desmids I present here some of the results of my research and my collection of Desmid pictures. Maybe it can help in determining what kind of Desmid you see under the microscope. All desmids shown on the pictures are found in the Dutch province of Drenthe. Comments on this site are welcome via the contact form (select Mailform in the menu left).